You can retain ownership of your land and conserve it using a tool called a conservation easement. This conservation agreement is drafted to meet your own goals as well as conserve the important conservation characteristics of your land. You can often retain a limited number of home sites and, depending on the property, additional structures are allowed. 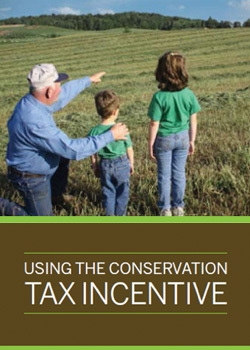 When you conserve your land with a conservation easement, you may qualify for federal income taxes between 50% to 100% of your adjusted gross income over a period of years. You would continue to own the land, manage the land, and pay property taxes. You can sell, bequeath, or transfer the land; the conservation agreement runs with the land.